I’m relaxing on a bench at the volleyball court in our apartment complex. My kids are skateboarding around with other children and the sky is nearly dark. I should have known this was a dangerous place to sit. “Oh, come on, it’s easy!” Another granny has joined the first one to recruit me. Yet another is across the court, setting up for ritual that invades my life each night. Our balcony is right above this court, and their music blares into our apartment at 8:00 p.m. every blessed evening. I could probably set my clock to it; in fact, it has become our family’s cue for the kids to go shower and change into pajamas. “You guys are really lihai, amazing. I can’t do all the movements you do,” I protest again, but I’m actually hoping they’ll continue on with their recruiting, hoping they’ll make the culturally appropriate third offer. Because I’ve been thinking about joining the dancing grannies for months. 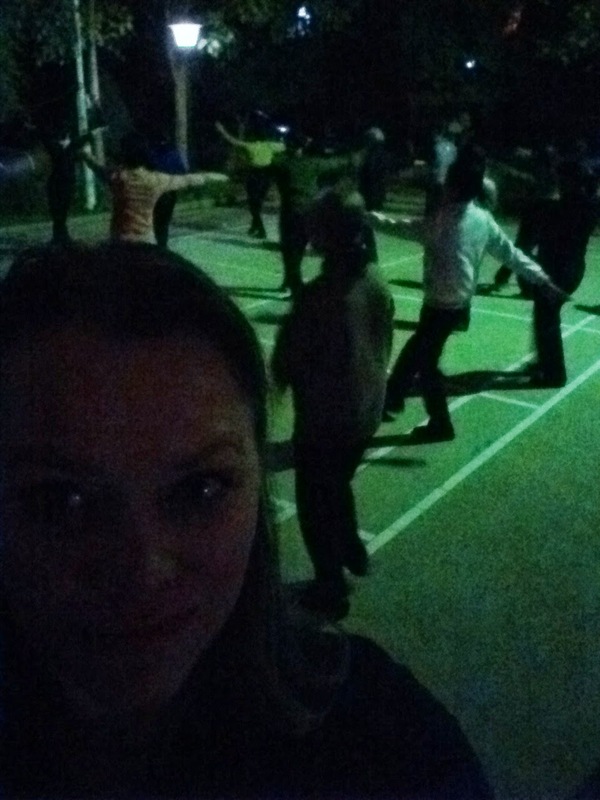 Every night, all across China, the dancing grannies gather on ball courts, in parks, or on public plazas to do group exercise. There’s normally a video being played at the front, which the leader (and anyone else who can see the screen) follows, then everyone follows the leader. Some groups get more elaborate, with matching outfits or even fancy costumes, but you can find at least a basic group in pretty much any apartment complex or park. Recently, the dancing grannies have made headlines in China and overseas, and it’s not necessarily for good reasons. They’ve been called a “nuisance,” a “scourge,” and “a threat to peace and tranquility.” Oh, and they’ve had poop thrown at them. In response, the government has tried to regulate the plaza dancing with better rules, and with an official plaza dance DVD that they expect all groups around the country to use. All that anger and poop-flinging seems to be on the east coast, though. Here in our town, no one seems to mind the grannies. Their music is loud, but it finishes around 9:00 p.m., which is pretty early for Guangxi. At any rate, it seems like a nice, fun thing to do, and I’ve been curious to join in. I’m not the right age. About 95% of these women are in their 60s or older. Some MUCH older. I get gawked at, shouted at, and photographed when I’m doing nothing more interesting than buying bananas, so I can’t even begin to imagine what passersby might do if they see me dancing in public. The dance routine is at a really inconvenient time, right when my kids are getting ready for bed. For a while now, though, as the kids shower and brush their teeth, I’ve been peeking out my curtains, following along a bit with the grannies’ routine in the safety of my own living room. I just haven’t plucked up the courage to overcome the above-listed obstacles and actually go participate. “The movements are simple, you’ll learn them really fast.” Granny One says as Granny Three starts the portable DVD player and checks the speaker volume. The intro music echoes off the surrounding buildings. Yup, ear-splitting loud. Perfect. “It’s good to get a little exercise.” Granny One has to shout for me to hear her now. “Okay,” I shout back, happy there really was a third attempt at persuading me. “I’ll try for a little bit.” There are more women coming out now. The music has called the masses, and they’re trickling down to the court from all over our apartment complex. In five or ten minutes, the court will be full, with 30 or 40 women participating. There will be younger women, too: young moms half-heartedly participating on the sidewalk or on the grass when they’re not keeping their toddlers from falling into the fish pond. I find a place near the back of the court, still wondering if this small town will explode when the giant blond foreigner starts marching to the music. As promised, the movements are all relatively easy to master. We do a certain movement for about a minute, then the DVD announcer shouts out the next one and we switch. Nothing high-impact, nothing that really gets the heart pounding, yet my arms are aching after only a few minutes. It’s the repetition that makes it a killer workout. The songs are all ones I recognize; after all, they’ve been the soundtrack to my post-dusk life for months now. Some songs are inspirational, some are patriotic, some are just fluff-pop. Lyrics talk about “the Chinese dream” (nothing to do with a house and 2.5 kids, I assure you), the beauty of Tibet, and how much I love you as we move in unison. Is this THE official workout? I wonder. Am I doing the exact same movements as millions of other women all across China, probably all at the exact same time thanks to Beijing Shijian?It’s a gestalt moment, but then I’m interrupted by my daughter, who wants me to help her track down her brother. I gratefully pop off the court to find him. My arms needed a break. The next few nights, I decide my kids don’t need such an early bedtime. When we hear the siren call, we dutifully stream out to the court with the rest of the neighborhood. I join the ranks of women (always near the back), and they join the ranks of kids (all over the place). I get stared at a few times by folks wandering by, but incredibly, no one points or takes my picture. Only once do I get shouted at, and it’s by a neighbor I know. “You dance?” She laughs. “No, I get enough exercise chasing my grandson around all day.” She continues following said grandson back to our building. A few days later, it’s time for us to move. Off to a new city. Par for the course in expat life. Weeks go by, and our family takes our after-dinner walk. We hear very familiar music coming from the neighborhood running track. We veer in and join the groups of Chinese families, all out for evening recreation. Kids chase balls and bubbles in the grass while parents chat. We find a place under a tree, and easily locate the source of the well-known music. A huge portable speaker system is set up, adjusted to the appropriate break-your-windows volume. A mass of elderly men and women are formed into rows and columns like a marching band. They’re doing the dance movements I know and love, but instead of marching in place, they’re slowly making their way around the track. Per usual, young moms are on the sidelines, arms doing the motions, eyes on toddlers who are playing nearby. I’m sort of singing along now, nearly nostalgic for my few days with the grannies in our previous town. My arms are itching to move. I do a few of the movements, off the track, next to my kids. No one stares, no one is surprised. Isn’t this what all women do in the evenings, all over the world? Huh, I think to myself. Part of me misses this. Maybe sometime soon, I’ll be a China dancing granny once again. I’ve always loved the dancing grannies! How can they be a nuisance?! I feel the same way! I guess in bigger cities, their loud music is disturbing residents. I have a hard time understanding how the music is more of a problem than construction noise, honking horns, etc., though, and I had the music blaring under my balcony.